One of the Best Places to Work in Madison! We’re thrilled to announce we were named one of the 2017 Best Places to Work in Madison by Madison Magazine! We’re especially grateful because this honor comes as a result of the good words spoken about Pilch & Barnet by our own employees! We value the people who choose to share their time and talents with us and do our best to treat them well. We know that the respect and appreciation we show them reflects in the great work they do for our clients. If you’re interested in seeing what Pilch & Barnet can do for you, call us today! A recent survey of nearly 6,000 marketers worldwide has yielded some interesting results about the state of social media marketing we want to pass along. In 2017, more of the marketers surveyed are using Facebook, Instagram and Snapchat than they were last year. However, Twitter, LinkedIn and Pinterest use declined 8%, 11% and 10% respectively. That’s not to say those platforms aren’t still important. We firmly believe that any social media network you can regularly maintain well is a beneficial one. Also of note, marketers continued to overwhelmingly rank Facebook as their most important social media platform and the numbers were even higher among B2C marketers. Facebook remains king of the social networks! The two top benefits of social media marketing survey takers listed were increased exposure (88% said this) and increased traffic (78% agreed). Improved sales was actually the benefit ranked last at 52%, but to be fair, that’s a pretty tricky conversion to measure for most businesses. So in all likelihood, sales are improving, companies just lack the tools needed to measure it. As for content, marketers said visual images were the most important type of content they shared. For the future, 75% of them planned to increase their use of videos and 61% said they wanted to incorporate more live video. Consequently, video was also the number one content form those surveyed said they wanted to learn more about. Virtual reality and 360-degree video came in close behind. Pilch & Barnet has been encouraging our clients to increase their use of video for years now, ahead of the current trend. Want to stay a step above your competition? Let Pilch & Barnet help! Our web team here at Pilch & Barnet has been pretty busy lately building some amazing websites. 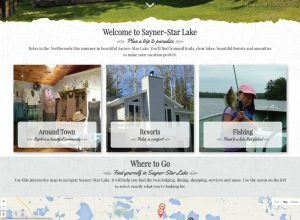 More are in the hopper, but within the last few months, we’ve proudly launched new sites for the Town of Land O’ Lakes Accommodations Commission, the Sayner-Star Lake Chamber of Commerce and Vilas County Tourism & Publicity. 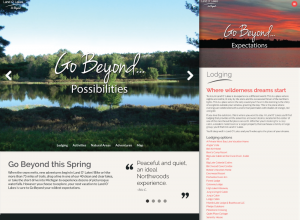 All three destinations are located in Wisconsin’s Northwoods and are visually breathtaking, so incorporating bold imagery was an important building block in creating their sites. Each makes use of large, colorful photos capturing the serenity and beauty of each destination, but also highlighting the myriad of activities available in each location. Travelers are able to easily imagine themselves there, fishing, paddling, biking, or just relaxing under the stars. Another key element is video. 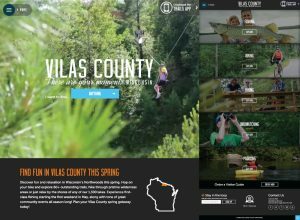 On Vilas County’s website, video is used to generate excitement about everything there is to do and see in the area – waterskiing, paddling, ziplining, shopping. The video immediately engages the site visitor with the season’s best fun and as summer turns to fall, and fall to winter, the videos will change too, giving the site a fresh look and always keeping seasonal activities in the forefront. On Sayner-Star Lake’s site, video will soon be incorporated to feature the area’s lodging properties and their proprietors. The identities and backstories of the folks who run these establishments play an important part of the experience of a Sayner-Star Lake visitor and video is an ideal way to capture those playful, larger-than-life personalities. Other important goals in our site building include ease of navigation, engaging but succinct copy, clear directives to our other marketing channels like social media and helpful, interactive maps. The common denominator here is usefulness. We’re web users and travelers just like the folks we’re marketing to, and we believe websites should above all, be useful. That’s why we strived to make it easy for visitors to find places to stay, things to do and maps to get them there. For travelers seeking even more info, we made it effortless to sign up for e-newsletters and promotions and a cinch to find more great photos and videos through our clients’ social media networks. Could your website use a facelift? Get it touch with us here. Just when you think you’ve figured out Facebook, they change it. Never fear, Pilch & Barnet is here. If you run a business page, you probably noticed a drop in total “likes” recently. That’s because Facebook is purging likes from deactivated and memorialized accounts. Should you worry? No. Why? Because these users weren’t seeing, engaging with or buying your stuff anyway. In fact, you don’t even have to leave Facebook to wire someone money now. You can do it through the Messenger app. Why? Because who likes leaving the house anyway? But seriously, be careful. It’s not the safest form of payment. Speaking of never leaving the house, Internet trolls beware. Some sites are now auto-posting your comments on Facebook. Why? Because you should heed my mom’s advice and never write anything you don’t want someone else to read. While we’re talking motherly advice, take mine and don’t take pictures of anything you don’t want other people to see, either. But for all your non-controversial photos, you can now edit them as you upload them to Facebook mobile. Crop, brighten, enhance. Why? So you don’t need other photo editing apps and you never ever leave Facebook. You can even add stickers. Why? There are just some things even I can’t explain. Technically, spring is here. And if you’re anything like me, it’s time to start thinking about a vacation to a place that is spring in practice as well as in theory. Spring is a great time to travel because rates are generally lower than during the summer. For example, rooms in places like Chicago, San Francisco and Seattle are down between 13-20% at this time of year and in some international destinations, like Turkey, they’ve dropped almost 30%. There’s a new travel trend taking hold this spring: hobby travel. Vacations dedicated to exploring your favorite books and authors, wine tasting, scientific research, religion – you get the idea. In case you haven’t grasped the power of photography in travel marketing, check out these gorgeous photo albums of spring around the world. In the mood for a road trip this spring? RV sales and rentals are on the rise. At Pilch & Barnet, we’re always scouring the Internet for the latest trends and helpful information about social media marketing. Today, we’re sharing with you some of our go-to social media favs. Jon Loomer. He’s a Facebook marketing coach, author, speaker and strategist. His website and Facebook page offer daily tips, blogs and first hand research. He also offers one-on-one coaching (for a fee). Put his sites in your regular rotation. Mari Smith. One of the world’s leading social media strategists and Facebook marketing expert. She’s got a ton of helpful info on her website and Facebook page as well, stocked with blog and tips. She offers a good number of free webinars of which you should take advantage. Mike Stelzner. He’s the founder/CEO of the website socialmediaexaminer.com and host of the Social Media Marketing podcast – one of the top 10 marketing podcasts on iTunes. He often blogs for the site, but it’s also full of helpful tips and articles from lots of other industry power players. Scott Monty. He’s the head of social media at Ford Motor Company, one of Forbes top 10 influences in social media. His blogs and podcasts are a great resource for advice about corporate communications and social media. Huffington Post Tech Section . They’ve got tons of blogs, helpful articles, interesting tidbits and its constantly updated. Big time social media influencers are often featured here as well. Cupid’s big day is almost here – make the most of it with this week’s Link Friday! Valentine’s Day isn’t just about sending cards and flowers and eating chocolate past the point of regret. Holidays can be important marketing opportunities you don’t want to miss out on. Planning a getaway for you and your sweetie can make for a Valentine’s Day to remember! Here are the best spots for a romantic escapade! Alone this V-day? Fear not. Here are seven ways to spend the day (and none of them involve being locked up with your cats, I promise). Awww, you shouldn’t have. No, really, you shouldn’t have. Cross-check this helpful list of bad gift ideas from Amazon.com before you decide on that “perfect” gift. 2014 is here – let’s take a look at what’s in store for social media this year! Facebook is constantly changing its news feed algorithm, making it harder and harder for brands to be seen. If you’re not already paying for Facebook ads, it’s something you should strongly consider in 2014. Everyone has a smartphone and they’re using them non-stop. Your website needs to be mobile optimized and so does your social media. Video is hot right now. Do not miss the boat on this one in 2014. Resolve to do better in social media in 2014. Here’s how. As the economy continues its rebound, travel is making a steady comeback too. Here’s what you can expect for travel in 2014. No surprise here. Experts predict higher airline fees and tighter seating this new year. Look for cheaper domestic flights and more free wi-fi in hotels in 2014. Some see an increased focus on boosting “happiness ratings” for flyers by providing shorter flights, fewer connections and more on-time departures. Experts say the cost of hotel rooms is on the rise, and consequently so are rentals of private vacation homes. Check out this list of the top travel destinations for 2014, which includes some unexpected locales right here in the U.S. of A. If you’re flying, find out if you lucked out or you’re bummed out about your airline choice –here’s a list of the best and worst for Christmas and New Year’s travel. The TSA has softened a bit on its travel restrictions. Click here to read the latest on what you can and can’t bring aboard your holiday flight. Maybe you just wish you were traveling somewhere exotic for Christmas! Daydream away with this list of the best places to spend Christmas. There is one man with more frequent flyer miles than all the rest: Santa. Track him around the world on Christmas Eve here. Last but not least this Christmas, entertain your friends and family with a personalized “Elf Yourself” video! And check out our video starring P&B principals, Lyn and Susanne!